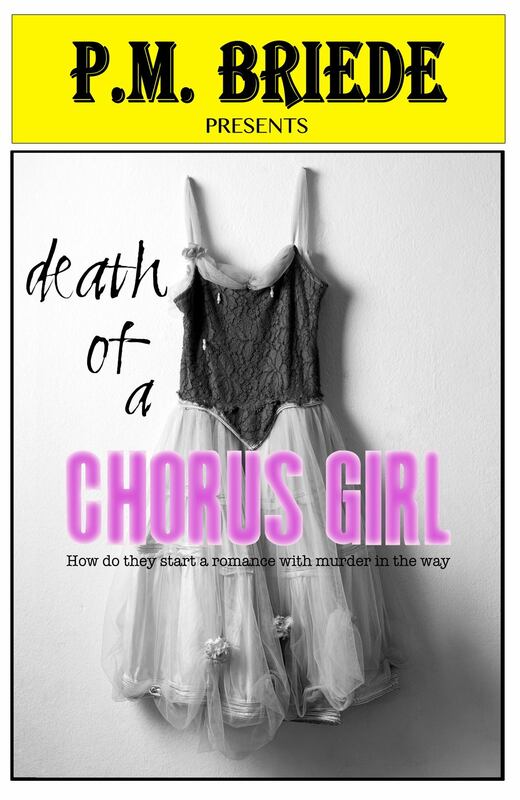 A CHORUS GIRL-AN EMPATHY- A DETECTIVE- CAN THEY SOLVE WHO KILLED THE CHORUS GIRL?? I rec’d an ARC of “ DEATH OF A CHORUS GIRL”. in exchange for an honest opinion. This is Mizmousey’s very honest opinion of this delicious book. It is written by P M Briede. I will say this before going any further- It was an honor an a pleasure to be able to read this book. Then to be able to say what I feel about it. The mouse feels very honored indeed. This book is an OMG A HOT MUST READ FOR ALL!! EDGE OF YOUR SEAT PAGE TURNER!! The way in which our outstanding author has written this mystery is truly remarkable, Not only is this story a murder mystery- but also has a touch of a love story in it..Ms. Briede has a very unique way in which combined the two together. a very shuttle one . You don’t even see it happening -it happens that fast. The cover of her book makes the reader wonder what the story itself is about- her characters have so much depth an feeling. You are able to see them standing right before your eyes!. Now as for the scenes! My goodness- after watching CSI on tv. I am totally amazed that Ms Braide is able to describe in such detail the crime scene to perfection. Even out ME is amazing. I have to give this amazing author just dues !! KUDOS AND TOP HONORS GIRL FROM THE MOUSE!! Never have I read a murder mystery like this one before. You had me at the opening page and still had me at the closing an hour later. I have to have more of Detective Richard and Empathy!! There has to be more in store for them. I am getting a head of myself some. when our book starts. Detective Richard is called to the broadway. A chorus girl has just been found dead. He goes there to investigate the crime. Upon arrival the women who found the body and the witness so to say is not there. The ME states wont know the actual cause till they get her on the table. Now during the course of the investigation- Richard rules out Empathy as a suspect. They start getting closer. He wants to have a relationship with her. But it seems he opens mouth inserts foot to spoil it. Then his chief wants to make her CI because of her connection to Richard an the men she is working with. She feels that Richard is just using her and has no feelings what so ever for her. This story has a lot of twist and turns. But before we can find out who murdered the chorus girl. we have a whole lot of parting to do. An a lot of mystery to go through plus following the clues. So will Richard be able to solve the mystery?? What happens between him an Empathy?? And who did kill the chorus girl?? I recommend this book to all readers-especially to those of you that love a good mystery!! Mousey gives it a firm rating of 50 out 5 stars. Now what are you waiting for??? Run and get your copy today it’s available for 99 cents!!! NOW RUN OR DANCE YOUR WAY THERE AN GET YOURS TODAY!! ← GET BOOK 1 NOW FOR $1.99 TILL MAY 9TH BY NINA MASON THE DEVIL IN DUKES CLOTHING!